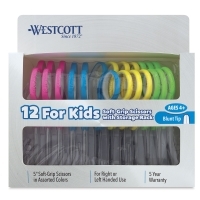 The Westcott Soft Handle Scissors Teacher Pack includes 12 pairs of Westcott Basic Soft Handle Scissors in a variety of fun colors. The handles are designed for left- or right-hand use and have a cushioned insert for comfortable cutting. 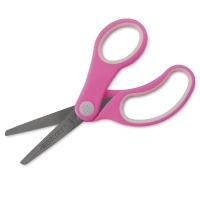 The strong, sharp stainless steel blades are securely riveted for durability. 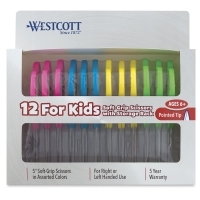 Choose blunt or pointed tips. Both styles are 5" (13 cm) long. These scissors are backed by a manufacturer's limited 5-year warranty.